New 2019 huge upper and lower back decks - fantastic! Pictures to follow! Our grandmother's house has come back in to the family! This precious house is conveniently located in downtown Blowing Rock on Main Street. Just walk downtown on the town trail and in a jiffy you will be in the middle of historic Blowing Rock. Shopping, restaurants, parks and much more are just steps away. This vintage charmer has had a total face lift with new exterior paint, new washer-dryer-dishwasher, new rugs, all new upholstered pieces with plenty of Grandma's antiques scattered through the house, new dishes, new pots and pans, new linens. 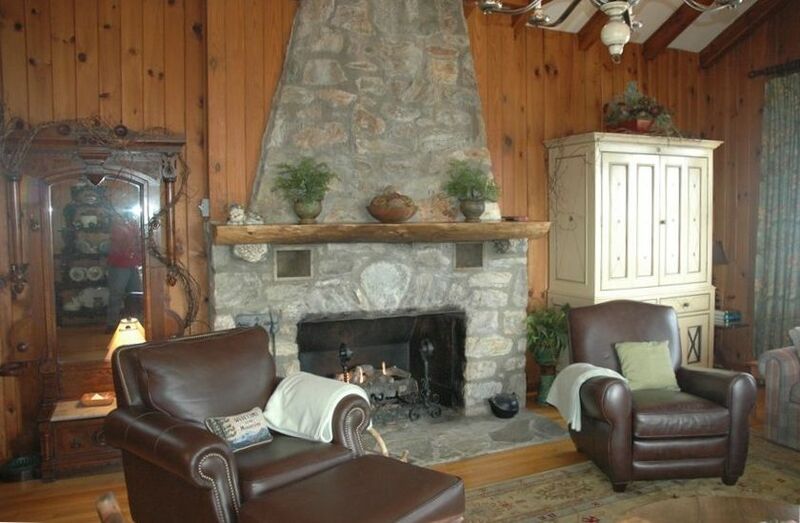 The amazingly large great room has a huge fireplace with a picture window overlooking Grandfather Mountain. The deck on the back of the house is a peaceful place with new porch furniture and more Grandfather Mountain views. Two cozy bedrooms downstairs with another porch. Convenient to the ski mountains and local golf courses. Cone Park, Tweetsie Railroad and Westglow Spa just minutes away. House has fast wifi internet and many premium movie channels including HBO, SHO, STARZ, ENC and more. We live in Greensboro and our children live in Charlotte and Greensboro. We both own our own businesses. Coming to the mountains is one of our greatest pleasures. We live in Greensboro and were so lucky to have the opportunity to purchase our grandmother's house. We actually bought the house from the person who bought it from her in the early 1980s. She purchased it in 1959. It is only two hours from Greensboro and a very easy drive. The house is so comfortable and cozy. There are so many wonderful restaurants and trails for hiking. The town is constantly having wonderful events that make it so much fun to visit. Shopping is great too. It is very close to the ski resorts- Sugar Mountain is about 30 minutes away. Appalachian Ski Mountain is 5 minutes from the house! Tweetsie is about 7 minutes from the house. This is our home rather than just a rental unit, so it has a lot of nice features like good linen, fully stocked kitchen, comfortable furniture, beautifully decorated. Recent renovations include two new huge decks, new roof and new front porch- new pictures coming! The trail to town is right across the street- in less than five minutes you can be at Monkees. It is fun to see the hustle and bustle of downtown, then come back and relax at the house. Our guests really love how unique the house is- very vintage! 2019 two new large decks- one upper, one lower. Pictures to follow! Lots of comfortable outdoor seating and dining. Beautiful decor. Comfortable furnishings. Love the fireplace -- kept us nice and toasty in the evenings. Kitchen has everything you need. Nice views from the home and porches. Walking distance to shops and restaurants. The owners were helpful and delightful to work with, and we can't wait to go back again. Wish I had a place like this of my own! PERFECT place to stay when visiting Blowing Rock! From the very start of the reservation, Pam was a pleasure to work with. Friendly and so accommodating. My husband and I vacationed with his cousin and his wife for a 3 night stay in Blowing Rock. The home is filled with Pam's family's treasured antiques and we felt right at home. Two spacious bedrooms offer their own bath...and the view from the back deck is gorgeous. The BEST part about the home is that it is within WALKING distance to downtown Blowing Rock. We were there during leaf looking season and the crowds were unbelieveable. To not have to worry about finding a parking spot for your car is great! Parking is available at the house..but not for more than two cars. The walk is less than 10 minutes and the path is across the street from the home and is well lit. We will definitely be back. Be sure to read the contract fully as the renter is responsible for doing the dishes and laundry before departure as well as taking your trash away with you. Pam was willing to waive the laundry as we had to leave before 8am to get to the Charlotte airport. Make no mistake...this is the PERFECT PLACE to stay while visiting Blowing Rock! It was beautifully redone on the inside. We had everything we needed except for soap (we hate that liquid stuff.) it would be nice to have some of the hotel-sized toiletries. The back porch was great with a nice view. The walk into town is very manageable, even for those not used to a lot of walking. Be careful of the driveway. It is narrow and hard to turn around. I had to get my husband to handle that maneuver for me! We played a lot of golf and especially enjoyed the Boone Golf Club. It was very reasonably priced and only a 15-minute drive from the house. Great house! The kitchen is equipped with everything you could need (even a slow cooker), comfortable beds, gas fireplace that warms the entire downstairs and a great back porch with a grill. The house is a short walk to downtown Blowing Rock which was really nice. Pam was a pleasure to deal with. We would definitely rent this vacation home again! Looking forward to having you return! Thanks for the kind words! My daughter and I stayed three weeks and loved every minute of it. You can walk to town, stay in and nap, or go over to the Blue Ridge Parkway to find hiking. The back porch has a view of Grand Father Mountain. We didn't want to leave.